Studio Electronics' new synth modules come in a range of different colours, each with its own distinctive filter and identity. In launching the Boomstar range, Studio Electronics have stepped from the protective cover of 19-inch racks and on to the desktop. 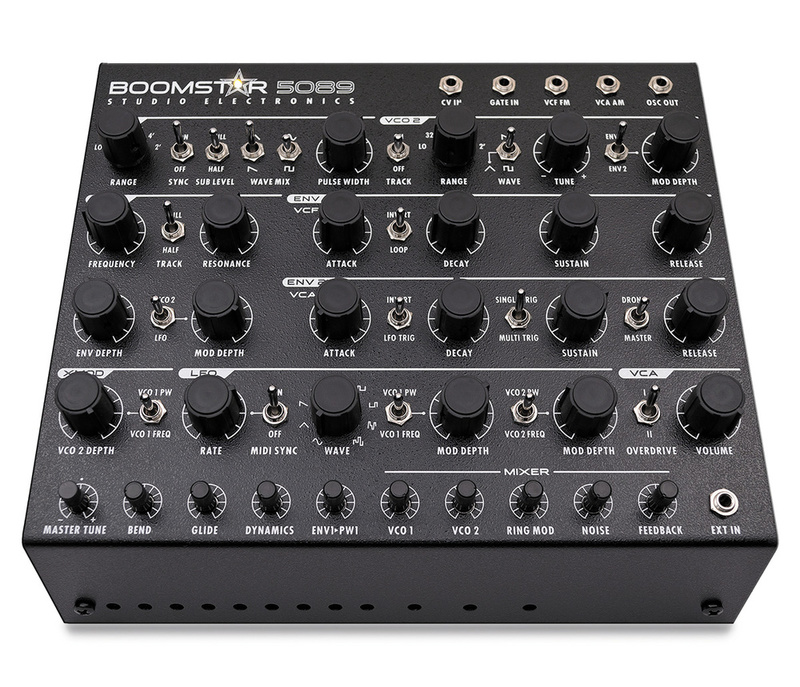 Produced in six different models to date, the Boomstars are monophonic analogue synthesizers that share a common design and layout; their individual personalities are shaped by the classic filters they contain. If this cunning ploy tempts you to start a collection, there's extra incentive in the form of a MIDI overflow function. This enables several units to be chained together polyphonically, as far as your budget stretches. Alternatively, they are equally content to be triggered by analogue CV/Gate synths and sequencers. The quartet vying for attention today are fitted with Moog, ARP, Oberheim and Roland filters. Whichever flavour appeals, each represents a whole lot of synthesis per square metre. Having cleared sufficient desk space to set up all four, my first impressions were favourable. Each is built into a solid and compact metal box with 23 large knobs, 10 'knobless shafts' and 18 switches. This barrage of controls is crammed into the most efficient — if not necessarily most user-friendly — pattern possible. It's no mean feat to provide adequate space around every control on a sloping panel just 220 x 180 mm in size. It's even possible to squeeze two Boomstars side by side in a 19-inch rack, providing you have the optional adapter (sadly not supplied with the review models). Half a dozen 3.5mm jacks, the majority conveniently situated in the top right-hand corner, are your gateway to analogue connectivity. The paint jobs are indicators of the filters inside, with Moog (Minimoog) in black, ARP (2600) in grey and Oberheim (SEM) in cream, leaving silver for Roland and their TB303 filter. In all other respects they're the same — except when a filter includes extra modes and therefore requires additional controls. Studio Electronics have resisted the temptation to embrace surface-mount technology based on the conviction their synths will be easier to service in years to come. These little 'stars are therefore heavier and more substantial than the analogue hardware we're becoming used to. 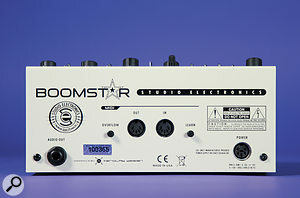 The Boomstars' back panels are fairly simple affairs, with just a quarter-inch audio output, MIDI I/O sockets with attendant Learn and Overflow buttons and an input for the external power supply.The LED nestling in the front-panel Boomstar logo turns red when power is supplied (there's no switch). When MIDI clock is received, the LED turns yellow (or orange depending on the viewing angle) and remains on for as long as the clock is present. This behaviour has the unfortunate side-effect of masking the LED flash of received MIDI notes. Ordinarily, the MIDI output serves as a soft Thru, but when you press the adjacent 'Overflow' button, out switches to 'note overflow'. This is a scarily simple means of achieving polyphony, with unused notes passed to other Boomstars further down the line. We'll check how that works in practice a little later... With no headphone jack, audio for each module is from a single quarter-inch output. And, despite selling at a price for which you might reasonably expect an internal power supply, what you get is a fairly bulky line-lump resembling that of a laptop. 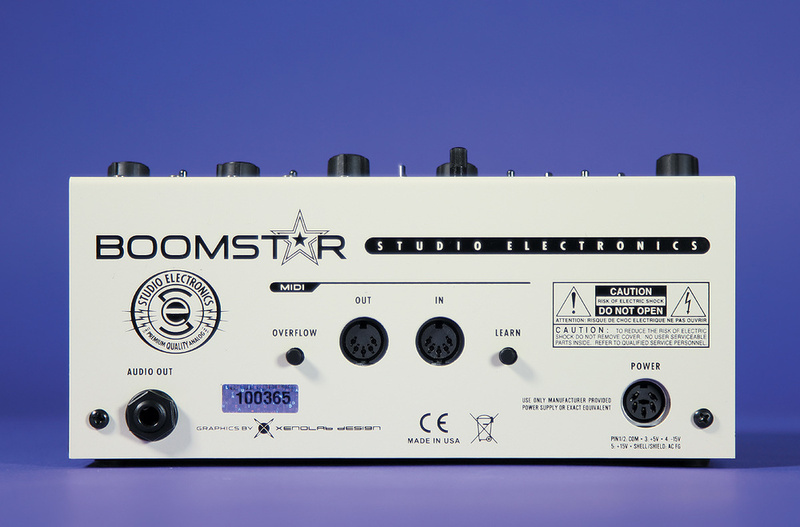 A Boomstar consists of two VCOs, two fast hardware envelopes, a single software LFO and that model-specific VCF. Ably assisting your chosen classic filter are attributes such as filter FM, oscillator cross modulation, ring modulation, feedback and overdrive, not forgetting old regulars PWM and oscillator sync. It seems that Studio Electronics were determined to cover all the bases! I opted for MIDI connectivity and what must be the fastest means of channel selection yet conceived. All that's required is a quick press of the 'Learn' button while you play a few notes. As long as you've got a recent Boomstar (OS2.0 or above), the learnt channel is retained after power-down. MIDI's few hard-wired connections are: mod wheel to vibrato, aftertouch to filter cutoff and CC7 to volume. Other than velocity control over filter envelope depth — for some much-needed dynamics — it's an old-school approach throughout. The knobs don't send MIDI CCs and the synth doesn't listen for them. There isn't even a way to add legato-induced glide, which puts constraints on any sequenced 303 patterns you might eventually conjure up. Studio Electronics are currently working on an update to (optionally) swap the actions of the mod wheel and aftertouch. They're considering other additions too, such as controlling the phase and speed of the LFO via MIDI. Existing owners to whom these enhancements appeal will need to organise an EPROM replacement as the updates aren't MIDI-flashable. The Boomstar 5089 has a distinctly Moogy personality.Unless you're in a darkened attic trying to navigate the very black 5039, the chances are you'll have spotted the 10 tiny knobs along the bottom. Or, rather, 10 tiny knob shafts. They feel up to the standard of those used elsewhere but, within the available space, it wasn't possible to cap them. We've coped with such inconveniences before — eg. on the Korg Monotrons — and I'd agree it's better to have the extra functionality, even if the implementation isn't perfect. However, knobs small and large earn the same general complaint; they're entirely black with no white indicator lines or dots. Visual feedback is something we take for granted on synths with no patch memories. The ability to see a patch and know instantly what to expect is a major contributor to such an instruments' appeal. I hope Studio Electronics will consider this plea for the future: new knobs, please! In order to become familiar with the forest of controls, I connected my Sequentix P3 sequencer and began firing note patterns at all four synths simultaneously. Several days later I came up for air, remembering I was meant to be writing a review! I hope it isn't too much of a spoiler to say that the Boomstars are fat, friendly and full — in the best trans-Atlantic tradition. Unstoppable basses, proggy solos and sound effects with extra balls gush readily from any of them. Eventually, instead of flitting from model to model in childish delight, I restricted myself to one so I could formally explore the architecture. I chose the SEM because its off-white paint job showed up best in my shadowy studio. No prizes for guessing that the Boomstar SEM is based on Tom Oberheim's classic Synthesizer Expander Module.Let's start with the oscillators. This pair have important differences, but we'll look at the similarities first. They cover a range from 32' to 2', plus an 'LO' setting, which shouldn't be a surprise when you learn the oscillators are broadly based on the Minimoog. VCO1 offers up to three simultaneous waveforms; a choice of triangle or sawtooth, sine or variable square, plus a square sub-octave. The switches' middle positions act as 'offs' but when the waveforms are engaged they're at a fixed maximum level, except for the sub-oscillator, which offers a half volume setting. While switches aren't as elegant as a genuine mixer, they work fine in the space available. Continuing the space-conservation theme, there's only enough room for one set of controls for pulse-width adjustment and envelope-sourced PWM. The first oscillator wins those but doesn't have all the best stuff. For a start, it's tuned via a tiny master tune knoblet, which I occasionally grabbed by accident. Fortunately this type of confusion should only be an issue when multiple Boomstars are arranged in a line. VCO2's regular-sized pitch knob has a range of seven semitones up or down. This holds true until you deactivate keyboard tracking, when the knob's range is dramatically extended. VCO2 has fewer waveform choices but isn't the poor relation. Amongst its alternative charms, I was blown away by the smooth oscillator sync. Flick a switch and either envelope may be used to drive the pitch. It's also worth remembering that sync doesn't have to involve moving harmonics at all: it's a valuable tool for carving out interesting new waveforms. The ring modulator takes that idea even further, into atonal, bell-like territory. It performs the expected sum and difference magic on the VCOs and is represented by a single level control in the mixer. The mixer comprises five knob-stalks that, as well as the ring modulator, include the VCOs, white noise and feedback. Even with all volumes at zero, there's a small amount of oscillator bleed-through on every Boomstar I tried. Plus there's an audible clicking from the envelopes, most obviously from the filter envelope at short decay times. Dropping out of analytical mode for a moment, I found these noises were more character-adding than problematic in normal use. However, the grey ARP model was noticeably noisier than the rest. With instruction, I was able to make a small improvement by adjusting the VCA offset via its trim pot, accessed from holes along the front. Ordinarily, the next logical stage following the signal path from oscillator to output is the filter. Deviating from logic slightly, the filters are rounded up and summarised in the 'Boomstar Shootout' section. Here we'll look at the envelopes which, as defined in classic synth lore, translates to an ADSR for the VCF and another for the VCA. I'm glad to report they're fast and snappy, with a noticeable bump at the top of the attack phase that adds extra weight to percussive patches. If that bump is reminiscent of the Minimoog, the decay handles more like the Arturia Minibrute in that all the optimum times for snappy sequencing are crammed into a small sweet spot of knob movement. Happily, the full gamut from long sweeps to punchy blips is yours in return for a spot of (sometimes careful) tweaking. The envelopes have a maximum release time of around 14 seconds (averaged amongst the four), plus an unusual quirk not often found in hardware: they must be retriggered before the sustain level can rise above its current value. In practice it's a minor inconvenience, meaning you can't 'fade in' a held but fully decayed note by the action of raising its sustain level. 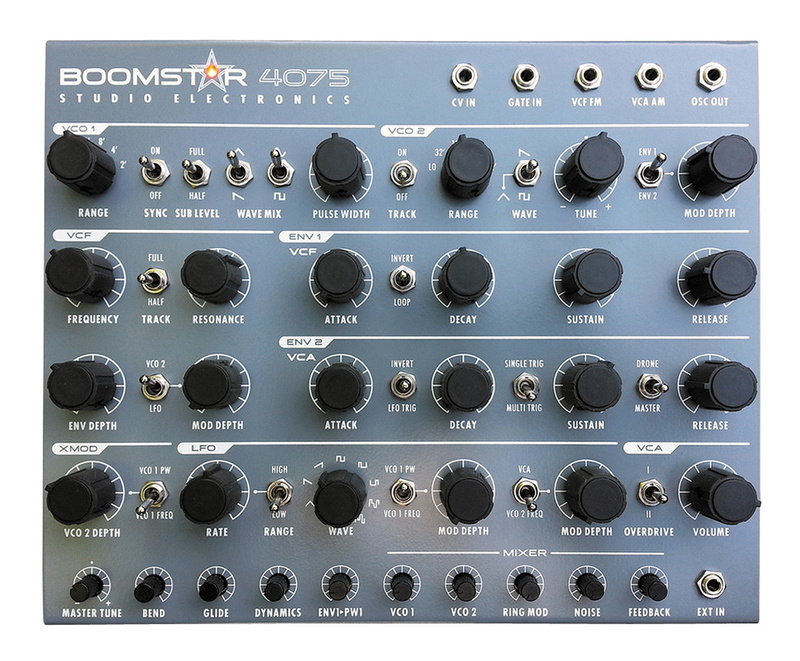 The Boomstar 4075 is inspired by the ARP 2600.Depending on your playing style, you're free to trigger the envelopes in smooth, Minimoog-like fashion or adopt the fast and precise multi-triggering of the ARP Odyssey. Flip the VCA switch to 'drone' and the envelopes are bypassed, which makes life easier when filtering external signals. It's also good if you happen to like drones. Alternatively, flip the same switch to 'Master' and the first envelope is disconnected from the filter. This isn't quite so pointless as it might seem because the filter envelope can be given another role — that of a simple LFO. When the attack and decay phases are set to loop, the envelope can be a source of extra vibrato or additional pulse-width modulation independent of the regular LFO. The envelopes have yet more to give. The output of either can be inverted (I'm sure somebody has a use for that) and although the VCA envelope has no looping facility, it has something even better: LFO triggering. When this is switched on and the LFO is synchronised to MIDI clock, you're suddenly inspired to produce all manner of smoothly decaying phrases of a type more common in the pre-MIDI days when a note's pitch and triggering were separate events. While you can sync to incoming MIDI clock at the flick of a switch, there's no precise indication of the clock division. As far as I could tell the range is from a leisurely eight bars up to 16th-note triplets at top speed. Usually, I found it to be a case of 'turn until it sounds right'. The LFO's continuous waveform selector starts at sine and progresses through eight other waves, including random (in regular and slewed varieties). Knowing that the LFO was software, I asked whether noise might be added to it in the future. After all, it's a modulation source welcomed by Minimoog fans and one of the very few connections not covered. Thanks to more of those ever-useful switches, the LFO can be routed to the pitch or pulse width of either VCO, and, of course, to the filter cutoff. A useful by-product of the three-way switch implementation means the middle position ('off') is always ready as a neat escape if you get bogged down in crazy modulation. Speaking of which, oscillator cross modulation (Xmod) involves VCO2 assaulting VCO1's pitch or pulse width. Audio level modulation is an invaluable source of freaky harmonics and usually the province of true VCOs rather than DCOs. The second oscillator can also serve as a modulation source for the filter cutoff (sadly at the expense of the LFO). This provides everything from taser-like zaps to Forbidden Planet levels of abstract madness, the degree of insanity varying according to the filter within. Studio Electronics have a long-established record for filter swapping. My first encounter was the different colours of the 'Analogue Tone Chameleon' ATC1 back in 1996. Coincidentally, it's the same selection of filters here as then. 5089: The classic 24dB Moog ladder filter in this model has a wet resonance that squelches like wellies in festival mud. It's an eternally smooth, warm and musical low-pass filter and everyone should probably own at least one. When overdrive is kicked in, the filter becomes hard-edged — but never too hard. Add low levels of feedback and it really does resemble the Minimoog regenerative effect of feeding the headphone output back in. Keep increasing the feedback and it quickly degenerates into a noisy screech, shredding the signal from around the half-way point onwards. Feedback is worth exploring with every filter and at all resonance levels for the many unsettling and warping effects it brings. Typically, a small amount goes a long way. 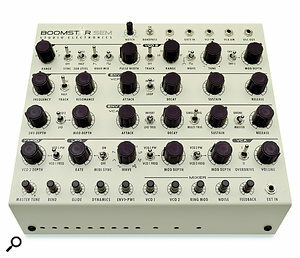 The Boomstar 3003 is based on the characteristic filter of the TB303.SEM: Having said that, feedback has the least impact on the cream-faced SEM. The filter is in recognisable homage to the 12dB multi-mode filter used in the original (and current) Oberheim SEM. It might even be my favourite of the four, in contrast to my thoughts 18 years ago. Where the Oberheim SEM had its band- pass selection incorporated into the notch control, here it's a separate (and rather stubby) little switch. Fortunately the effect is the same. As long as band-pass isn't selected, the notch control sweeps from low-pass response through to high-pass in a single, unbroken movement. The SEM is therefore capable of lighter, more subtle tones than the other three models. This isn't to suggest the filter's low-pass mode can't cater for fat and punchy, because it can. At maximum resonance you don't quite hit oscillation, although this SEM gets closer than my dear-departed Oberheim Two Voice ever did. Comparisons are probably misguided though as the Boomstars have a markedly different architecture. For example, I chanced across a very un-SEM-like 'fluffy acid' patch by setting the notch and feedback to around 10 o'clock, overdrive on and resonance to max. That took care of another afternoon! 4075: The grey-faced Boomstar is fitted with the 24dB filter from the ARP 2600 and boy does it rasp and scream! In theory it's Moog-like but in practice the least predictable of the filters and the one with the most cutting — but not unpleasant — resonance. When auditioning low-pass filters, resonance is usually the most obvious characteristic that separates them. High resonance became a key component in almost all my favourite 4075 patches. Pairing a resonant sweep with the rich oscillator sync produced an endless line of quality solo patches as applicable to progressive rock as psy trance. With a full bass end too, the filter is sure to be popular as a Moog alternative. I'd describe its response to feedback as 'unrestrained'. Indeed, feedback alone, with the noise and oscillators turned right down, can summon up a monster sound source. If you then introduce an oscillator, even at very low levels, you should prepare for several hours of indulgent bog-eyed soundscapes. 3003: As you no doubt guessed, the silver 3003 is fitted with a 24dB TB303 filter (these are very popular, apparently). Of the four, it is the closest in tone to the 5089, but while the 3003's filter is rightly famed for bass, that's not all it can do. I found it slightly darker than the Moog and it retains more bottom end at higher resonance. Set at maximum, the resonance turns into liquid acid, and who can resist dialling up a fat Moogy sawtooth or square wave, a spot of glide, and doing what comes naturally? Switching into overdrive puts the proverbial 'donk' on it, while feedback progressively destabilises — as it does for all the filters in varying degrees. When fed high levels of resonance and feedback, the 3003 will eat the bass then howl at the moon. Regardless of the model chosen, all filters are up for a bit of external signal processing. There are also several key factors that change the filter response. Oscillator level is always important and here, having tiny controls means setting accurate levels is a bit hit and miss. With three of the models, if you exceed a level of approximately 75 percent, the filter starts to be gently overdriven. The SEM filter has a lower input threshold and therefore 'browns out' somewhere around 65 percent, which incidentally edges it closer to the saturated Oberheim SEM sound. Filter tracking isn't continuously variable but is offered at half or full. Finally, for a blatant overdrive, flip the switch in the VCA section. It's basically what you'd expect '11' to sound like. The Boomstars are brand-new analogue synthesizers covering a generous range of classic tones. The choice of models presents something of a dilemma though. Having played four of them on most days over a three-week period, I'm still hard pressed to decide which I'd go for. The 5089's Moog filter is as musical, versatile and desirable as ever. The 12dB SEM filter is very distinctive, its multiple modes giving extra scope despite its restrained resonance. In contrast, the 4075 is pure unfettered attitude and the one best suited to work as a stun weapon. This leaves the 3003 and its deeply acidic tones and chirpy resonance. If it's hard to pick a favourite out of four, it's probably just as well the other two Boomstars didn't arrive in time for this review. The latest additions to the range are fitted with the Korg 700 filter and that of Yamaha's CS80 respectively. Each filter has its own character, yet there's enough commonality to make chaining different models at least feasible. Given the number of controls, I have my doubts whether it's practical to tweak, say, four of them for polyphonic use. However, polyphony is a minor consideration. 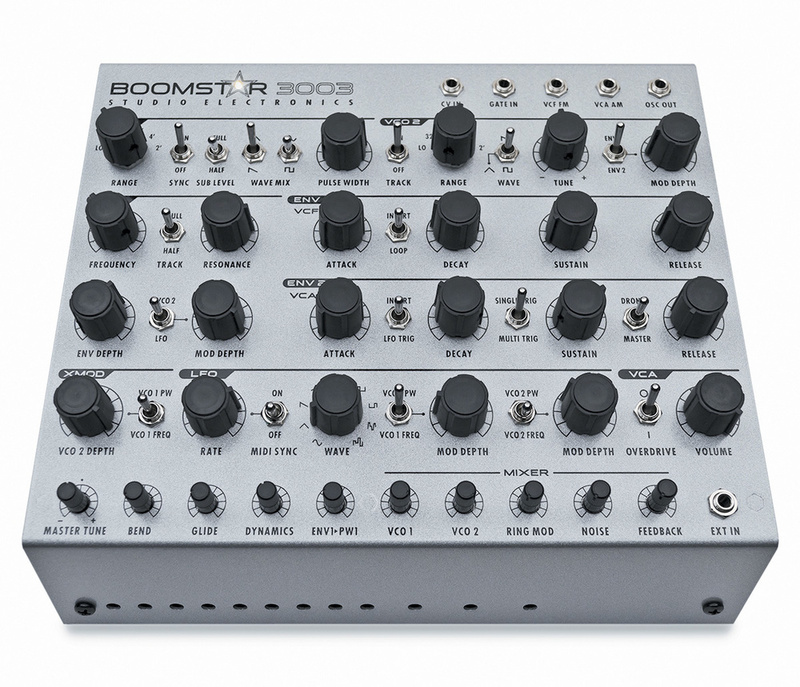 After all, with rich modulation on offer and that irresistible oscillator sync, any Boomstar would be a great addition to a sequencing or soloing arsenal. With the possible exception of the grey 4075, the noise levels were acceptable, but I did have some misgivings. For example, during development, I'd have expected someone to have ventured the following thought: wouldn't it be nice to see where all the knobs are pointing? Similarly, I realise that knobless shafts are useful space-savers, but they also feel like compromises on a synth that's otherwise so complete. Ditto the external power supply. Finally, in an ideal world there'd have been either a more comprehensive MIDI spec or more CV inputs. However, all these shortcomings are easy to forgive because the Boomstars sound so damn good. In spite of their size, they are hands-on synths full of character, choice and tweakability. A number of alternatives come to mind, including the more expensive Oberheim SEM, which exists in three versions including a fully patched-out model. For the authentic sound of Moog, the Minitaur is cheaper but also much less complex. In its favour the Minitaur has extensive MIDI chops and software that acts like a plug-in. Or there's the not-very-knobby Waldorf Pulse 2 with its trio of DCOs, in-depth modulation matrix and patch memories. If you still regard MIDI as one of those passing fads with no future, the Boomstars are readily played from their CV and Gate inputs. I connected the 1V/Oct CV and Gate signals from my MFB Tanzbär drum machine and took a further CV output to control the filter cutoff. Incoming voltage can also drive the VCA level and thus provide external dynamic control. Outputs are rather thinner on the ground. There's just one: the combined signals of the two VCOs. If you have several Boomstars you could therefore achieve a degree of cross modulation between them, although separate CV inputs for each oscillator would give that idea far more weight. Finally, in other developments, the individual filters are planned to be released as Eurorack modules in conjunction with Pittsburgh Modular. So far the 4075, 5089, and 3003 filters are ready, plus there's a discrete VCA module also ready to go. 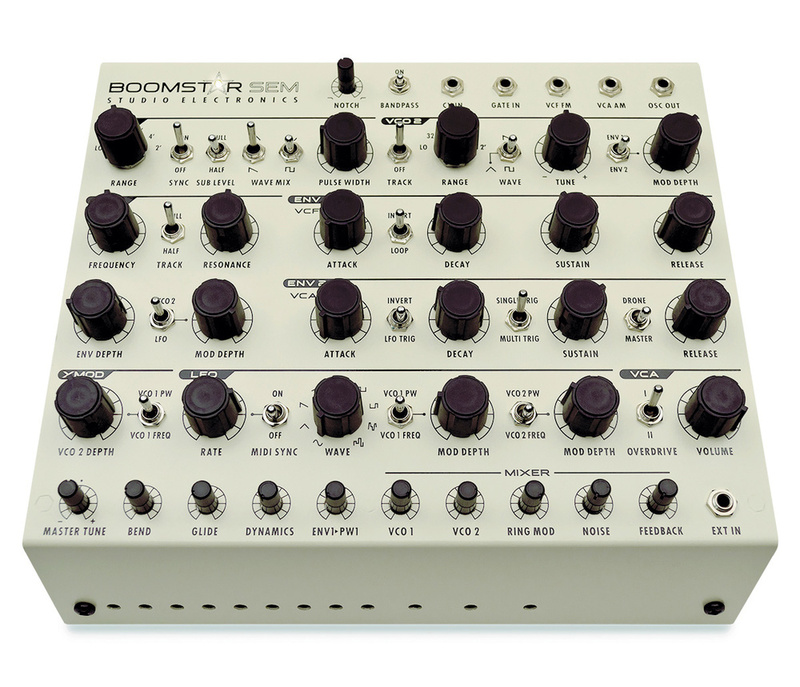 I'm told there are future plans for a fully modular Boomstar with a comprehensive CV-to-MIDI module. If you have two or more Boomstars, each can be connected in a MIDI chain. When the Overflow button is pressed, any notes the first synth can't handle are passed onwards via the MIDI out socket. The notes received at the next input are given the same treatment, and so on. This should be good for at least 10 Boomstars before any MIDI delay is experienced. The voices are always triggered from the first available rather than the more common round-robin fashion. This therefore is a major influence on the way you play. Polyphony also has a bearing on the type of patches you program. After all, polyphonic Minimoog bass is just plain wrong. No conventional polysynth offers such variations between voices, although you're faced with a large number of controls to set up even once — let alone multiple times. While potentially interesting, it's possible polyphony could place quite a high demand on your patience. They're big, fat, powerful synths in small metal boxes. Versatile synthesis and a generous allocation of knobs and switches. Choose the colour, choose the filter. MIDI or CV/Gate operation, plus extra patch points to interface with Eurorack gear and suchlike. The style and uniformity of knobs takes away some of the joy. 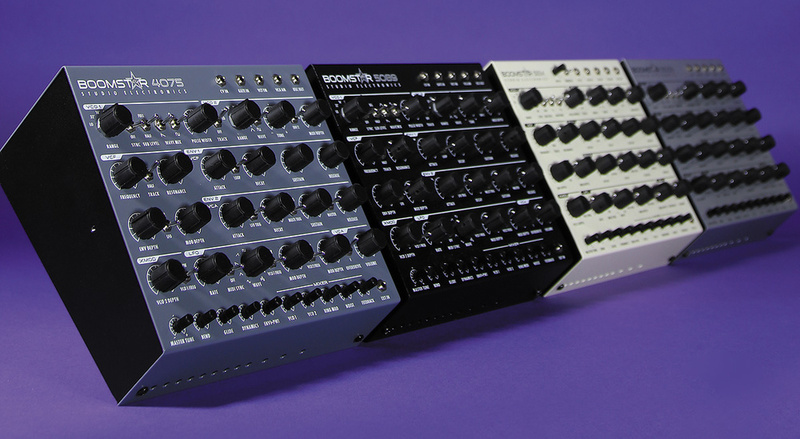 An excellent-sounding range of analogue synths, each with its own classic filter. The only problem is which to choose.